The Peoria Park District’s Planning Committee compiled the following list of Park District holdings that they recommended for inclusion in a register of Historic Resources. This list comes following Park Board approval of a Historic Preservation Ordinance in June 2007. In 1898, the Decorative Stone Fort was constructed as a part of a larger complex within the Glen Oak Park Lagoon. The Stone Fort is home to a Spanish cannon, a trophy of the Spanish-American War. The cannon was cast in Seville, Spain in 1845 and subsequently dedicated in Glen Oak Park on October 11, 1899. Weighing 1,275 pounds the cannon, a costal model “24” was manufactured of a lightweight recast bronze. During the early years of Glen Oak Park, the Stone Fort was linked by an arch bridge to Rose Island. Heavily landscaped, Rose Island housed a shelter, a boat rental and other amenities. Boats were rented for fifteen cents per hour, allowing park users to oar around the lagoon. Electric Lights were strung around the lagoon providing for nighttime boating and ice skating. A stone warming house was later constructed to provide a respite for ice skaters. In the 1930’s, pens for peacocks, golden pheasants, quail and doves were also located on Rose Island. Over the past century, many changes have been made to the Glen Oak Lagoon feature in the Park. The entire infrastructure supporting the lagoon has been reconstructed multiple times and Rose Island has given way to the Glen Oak Amphitheatre feature. Remaining is the Decorative Stone Fort. In 1978, the Stone Fort underwent a major structural rehabilitation. The masonry project included the removal and replacement of the top rails, construction of a new concrete deck, a new cannon mount and tuck pointing where needed. During late 2002, two large cracks developed in the wall coupled with the loss of multiple stones. Over the next few days, the cracks continued to worsen and the separation of the wall and railing occurred. Fearing a total failure of the underwater foundation, Park District crews placed a braided steel cable around the perimeter to prevent a complete collapse. The Park District sought public bids for a total restoration of the Stone Fort in 2004. A sole bid of $843,270 was rejected due to cost. In 2006, a scaled-down project was bid and once again the low bid of $245,100 was rejected because it was nearly twice than the amount budgeted for the job.The Stone Fort was fenced off for the safety of the public. In 2008, the Board of Trustees authorized the construction of a retaining wall or lagoon bulkhead in the water around the stone fort. This will allow access to the foundation of the wall by a structural engineer in order to arrive at a design to stabilize or rebuild portions of the wall. At the conclusion of the engineer’s examination, a report with recommendations will be forwarded to the Board for their review and action. Currently, funding is in place for the engineering work, but construction/restoration funds would need to be budgeted by the Board, most likely from future yearly bond issues. As one of the remnants of the original Glen Oak Park Lagoon design, the Stone Fort is suitable for landmarking under criteria A, B, and C of the District’s Preservation Ordinance. 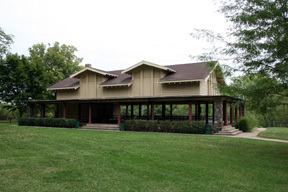 Glen Oak Pavilion is the well-recognized centerpiece of Glen Oak Park. Designed by Peoria architects William Reeves and John Baille, the Glen Oak Pavilion was completed in 1896 for a total cost of just less than $25,000. Originally, the Victorian-style structure served as a public shelter, an ice cream parlor and a dance hall. The Pavilion served as the Park District’s first multipurpose public building. Over the years, the Glen Oak Pavilion has undergone a number of renovations and served a wide variety of uses. The building has been used as a catering center, a banquet hall, an ice cream parlor and dance hall. During the mid to late 1930’s, animals were placed in the Pavilion for winter quarters before being moved to cages on Rose Island. The Police Chief and other administrative offices were moved into the lower pavilion in 1939. At one point in time, the building served as an apartment for a Park District employee. Administrative offices moved out of the building in 2014 in preparation for its transformation to the Peoria PlayHouse Children’s Museum. As a structure, the Glen Oak Pavilion qualifies for Historic Designation and listing under criteria B, C, D, E, and F.
The original iron suspension bridge was constructed in Glen Oak Park in 1902. Compiled of masonry columns, a system of braided steel cables support two, 25 foot approach spans and one, 50 foot clear span of the wooden deck suspension bridge. Initially, the iron suspension bridge was designed to provide public access from the pavilion to the lily pond, palm house and assorted gardens. Major structural repairs and renovations to the bridge were completed in 1926 and 1952. In 2002, the entire wooden deck was removed and replaced. In conjunction with the Glen Oak Zoo project, Clark Engineers completed a thorough evaluation of the structure in 2003. The bridge was found to need significant structural repairs and was closed to protect public safety. Park District staff sought funding for repairs in the 2008 capital budget, but it was not approved. As one of the remnants of the original Glen Oak Park design, the Iron Suspension Bridge is suitable for landmarking under criteria A and B of the District’s Preservation Ordinance. Humane fountains were constructed in many of the early parks as a means of providing water for horses until the automobile became a primary method of transportation. Many fountains were erected by humane societies such as the American Society for the Prevention of Cruelty to Animals. In addition to the necessary function of preserving the health of horses, these fountains were often artistic in their design. The central feature of the Kinsey Memorial in Glen Oak Park is an elaborate horse humane fountain. It is one of two remaining humane fountains within the Peoria Park District. Although no longer operational, the fountain and memorial structure surrounding it are in good condition. Kinsey Memorial is currently a popular site for picnicking in the park. As one of the few remaining humane fountains within the Peoria area, and a more than a century old structure in the Park, the Kinsey Memorial is suitable for landmarking under criteria B and D of the District’s Preservation Ordinance. The Kinsey Sundial was located near the Palm House for several decades. In the late 1970’s, the sundial was placed on permanent display in the herb garden at Luthy Botanical Garden where it still stands today. Read more about this sundial in a story by James Ludwig. In 2013 James Ludwig published a follow up article. Both articles have been published in Compendium, the journal of the North American Sundial Society. As more than a century old landmark, the Kinsey Sundial is suitable for designation under criterion B and D of the Park District Preservation Ordinance. Robert Gilmore LeTourneau was born on November 30, 1888 in Richmond, Vermont. LeTourneau was a self-educated engineer, a most prolific inventor, founder of LeTourneau, Inc., and LeTourneau University in Longview, Texas. R.G. LeTourneau was well known as a Christian and a generous philanthropist to Christian causes around the world. Throughout his life, LeTourneau was awarded more than 300 patents for his innovations in the earthmoving industry. For example, he was first to develop all-wheel electric drives. These extremely large machines were an integral technological component in the successful development of a mobile off-shore drilling platform. LeTourneau was the first to use rubber airplane tires on large machinery. LeTourneau developed and sold much of the country’s early earthmoving equipment in Stockton, California and then from headquarters in Peoria. His designs for scrapers and other large equipment have evolved into modern road machines manufactured by Caterpillar and other companies. LeTourneau was renowned for designing and building machines that elevated the earthmoving industry to new levels of efficiency and productivity. R.G. LeTourneau’s machines represented seventy percent of all the earthmoving equipment used during World War II and were also instrumental in the construction of the Hoover Dam. He also developed the first portable offshore drilling platform in the mid-1950’s. Today, more than 135 of the jack-up drilling rigs are in operation worldwide. A memorial statue of R.G. LeTourneau was dedicated in upper Glen Oak Park on May 21, 1988. The R.G. LeTourneau statue was moved to the Wheels ‘O Time Museum off of Rt. 40 in Dunlap in 2017 as part of a new exhibit. The statue will be on permanent loan to the Wheels ‘O Time Museum and is displayed adjacent to a relocated steel house that was developed by R.G. LeTourneau in the 1930’s. From the earliest days of Glen Oak Park, the Old Settler’s Association has had a presence within the Park. In 1897, the Old Settler’s financed the construction of their first log cabin and subsequently a replacement cabin in 1927. The cabins were used to house pioneer artifacts and served as a site for the association’s social gatherings and business meetings. Other memorials have also been constructed in Glen Oak Park by the Old Settler’s. A large monument created of stones in 1929 remains in the park today. The monument is twenty-seven feet high and eleven feet in diameter at the base. More than twenty-five thousand stones of various diameters were donated for the project, by people who had been living in Peoria County for forty or more years. Approximately 15,000 stones were used in the construction above the ground and the remaining 10,000 were used to form the foundation. An eighteen-inch copper box was placed in the monument containing histories of the County Farm Bureau and telephone companies. The monument remains in place within the zoo grounds. It was dedicated on August 26, 1931. In 2004, the Old Settler’s Monument was completely restored and re-pointed. Currently, the structure is in excellent condition. As the last remaining Old Settler’s Monument in Glen Oak Park, it is suitable for landmarking. In keeping with the purpose and intent of the District’s Preservation Ordinance, the Monument qualifies for Historic Designation under criteria B and D.
During the early 1900’s, the Park District completed several landscape beautification projects in lower Glen Oak Park. By 1920, a sunken garden, an electric fountain and pool, ornamental pedestals, vases, concrete steps and walkways were all constructed in lower Glen Oak. As a part of the overall landscape enhancement plan, a “New Pergola” behind Ingersoll was contemplated by the Park Board. In 1917, bids were received and a contract was signed for the construction of a concrete and wooden pergola. Currently, the Pergola is in place in lower Glen Oak Park and is being restored. All carpentry and painting work shall be completed by early fall of 2007. As one of the remnants of the original lower Glen Oak Park design, the Pergola is suitable for landmarking under criteria A, B and C of the District’s Preservation Ordinance. Robert G. Ingersoll moved to Peoria to practice law in 1857. Ingersoll quickly earned a reputation as an exceptional trial lawyer. He practiced law locally until 1877. Ingersoll, a Civil War veteran, served as a Colonel of the Eleventh Illinois Cavalry regiment. His regiment received special praise for their action in the battle of Shiloh. From 1867 to 1869, Ingersoll served as Attorney General of the State of Illinois. Additionally, he was a prominent member of the Republican Party, although never holding an elected position. Ingersoll’s “Plumed Knight” speech greatly helped James G. Blaine win the Republican nomination for the 1884 Presidential election. Ingersoll was noted as the most popular orator of the age. A self-proclaimed “agnostic”, Ingersoll was a champion free thinker and a defender of the ideals of Charles Darwin. Many of his lectures were more than 20,000 words and kept him speaking from memory for two hours. Throughout his lifetime, Ingersoll lectured in nearly every large city in the United States. His audiences ranged from 1,000 to 5,000 people. In addition to Peoria, Ingersoll maintained an extensive legal practice in Washington, D.C., through 1885 and finally in New York until 1899. Ingersoll died on July 21, 1899. The Ingersoll statue in Glen Oak Park was created by sculptor Fritz Treibel in his studio in Genoa, Italy. Peoria, Eugene Baldwin facilitated the shipping and the installation of the statue. In a ceremony attended by his widow and daughters, the statue was dedicated on October 28, 1911. The Ingersoll statue qualifies for listing in the Park District Register under criteria A & D.
Throughout its history, the building has been used as a shelter, for concessions during special events, and most recently for a public information center. The original design of the Small Animal House has undergone significant modifications. This unique structure is suitable for landmarking under criterion B and C of the Park District’s Preservation Ordinance. Otto Triebel was born in Roemhild, Germany in 1830. At the age of fourteen, Triebel began to study sculpture and essentially devoted the rest of his life to working in marble. Throughout his life, Triebel was one of Peoria’s most prominent, well-respected and talented citizens. His public service included several terms as city treasurer, county supervisor, and as a school inspector. The Triebel Lions were originally placed on either side of the Adams Street approach to the Peoria County Court House in 1903. The lions remained on display at the Court House for the next sixty years. In 1963, the Peoria County Court House was razed and the Peoria Park District rescued the sculptures. The Triebel Lions were relocated to Glen Oak Zoo for permanent display. For the past forty-four years, the Triebel Lions have been distinctive landmarks within Glen Oak Park. The Triebel Lions are suitable for listing under criteria B and C of the Park District’s ordinance. In 1901, the Briggs Real Estate Company of Toledo, Ohio, developed the Uplands adjacent to upper Bradley Park. The developer approached the Peoria Park District with a proposal to erect a fountain, monument or other suitable ornamental structure at an intersection on Chambers Avenue which led into Bradley Park. The Biggs Company ultimately chose a statue of Christopher Columbus. The statue of Columbus was created by sculptor Alfons Pelzer, and was manufactured by the W. H. Mullins Company, Salem, Ohio in 1896. Chambers Avenue was renamed Columbia Terrace in conjunction with the Columbus dedication on Sunday, October 15, 1902. Throughout its 107 year history, the Christopher Columbus statue has been a victim of repeated vandalism, including bullet holes and an attempt to remove a leg. On March 22, 1983, the statue was taken down and stored on Park district property awaiting repairs. The Italian-American Society, members of the Uplands Homeowners Association, and Peoria Park District raised $14,000 for the restoration project. Sunderland and Associates were hired to clean, repair and reinforce the interior of the statue for $7,300.00. On October 13, 1984, the Christopher Columbus Statue was rededicated in Laura Bradley Park where it still remains today. In keeping with the intent of the Park District’s Historic Preservation Ordinance, the Christopher Columbus Statue qualified by listing under criteria A & D.
In 1897, engineer H. Fahenstock reported the expenditure of $10,000.00 during the season for general permanent park improvements in keeping with the plans adopted for the construction of Bradley Park. Projects contemplated included: the completion of the grading and graveling of all driveways (the Main Street entrance and Chambers Avenue), finish grading of the large lake basin and the construction of two iron bridges across the necks of the lake. To construct the lakes in Bradley Park, approximately 22,000 cubic yards of material was excavated and used to develop the roadways. There were also 2,500 trees and stumps removed in conjunction with the project. On February 16, 1898, a contract for the erection of two steel bridges across the lakes was let to Thatcher A. Parker, of Terre Haute, Indiana. The contract amount of $2,345.00 was for the construction of the superstructure of both bridges. Four concrete bridge piers were completed by Park Division personnel for a total cost of $484.37. In conjunction with the steel bridges, a series of dams were built to regulate the flow of water and debris into the lake. The dams constructed were able to hold back water for several days but ultimately the water volume of Dry Run Creek washed them out. Seeking a solution to the problem the Park Board hired engineer B. H. Colby, of St. Louis to make a recommendation. To construct a lake, Colby suggested coating the entire surface area with a four-inch clay liner, building a “large” dam, and engineering a solution to keep driftwood, sand and silt from entering the lake bed. Because of the extreme cost of the project, the lake feature was not adhered to. One of the two steel bridges erected in 1898 remains in Bradley Park today. The structure is used as a pedestrian thoroughfare. As a 109-year old structure, the steel bridge is appropriate for designation under criteria B and E of the Preservation Ordinance. The Japanese Bridge in Bradley Park was designed by Frederick John Klein in 1920. Klein, a noted Peoria architect, was as widely known for his public buildings as he was for the many stately residences he designed throughout Illinois. He was self-taught, but because of his outstanding abilities, he earned his way into membership of the American Institute of Architects. Other local Klein creations are schools, including Peoria High, Washington and Franklin. He also designed homes along Grand View Drive and the shelter in the lower Grand View Park. By the end of 1920, many of the planned improvements had been completed in Bradley Park. The Japanese garden, artificial lake, and ball diamonds were in use by the public. Because of the high cost of material and the shortage of labor the Japanese Bridge connecting the Japanese Garden with the playgrounds was temporarily delayed. Currently, the Japanese Bridge is in use and an integral part of the Bradley Park landscape. The structure is in generally good repair and has had all wooden portions treated by an epoxy wood restoration system, caulked, primed and painted during the summer of 2007. The Japanese Bridge is suitable for landmarking under criteria A, B, and D of the District’s Preservation Ordinance. The majority of the Park District’s preservation efforts have been done in conjunction with the Illinois Nature Preserves Commission. Dedication is essentially a voluntary, legal process whereby the Park District restricts future uses of environmentally significant areas to ensure they remain in a natural state. Dedication as an Illinois Nature Preserve is in perpetuity and provides permanent protection of the land. An Illinois Nature Preserve is protected from any type of intrusion including eminent domain. Adverse uses such as logging, soil removal or any sort of destruction of plant and animal life are statutorily prohibited. Each of the Park District’s dedicated preserves is under a specific management plan for that given area. Cooperatively developed management plans follow the strict guidelines of the Illinois Nature Preserves Commission. The Commission normally approves a master plan and a three-year management plan schedule for the preserves. Currently, the Peoria Park District owns 1,589 acres of dedicated Illinois Nature Preserves. These Preserves include: Detweiller Park, 246 acres; Forest Park North, 357 acres; Forest Park South, 135 acres; Robinson Park, 151 acres; and Singing Woods, 700 acres. The entire 1,589 acres of Dedicated Nature Preserves are “Qualified Historic Properties” under the existing Park District ordinance and secondarily are appropriate for designation under criterion E.
Grand View Drive’s topography and design integrity is much the same today as it was when the parkway was developed in 1903. The 2.52 mile meandering pleasure driveway has retained all of its original design. The location and dimensions of the scenic views have changed very little over the past 104 years. Grand View Drive met criterion C for listing in the National Register of Historic Places due to the local significance of its landscape architecture. The Drive is significant as an early example of the design talents of Oscar F. Dubuis, and its period of significance is from 1903 to 1918, the year Dubuis’ plan was implemented. On September 14, 1996, Grand View Drive was officially listed in the National Register. In keeping with the purpose and intent of the District’s preservation ordinance, Grand View Drive shall be listed in the Park District’s Register of Historic Places. The giant burr oak at 424 W. High Street has been a significant landmark in Peoria for more than a century. How long the oak has stood cannot be said for certain, but at least since 1835. With a girth of fourteen feet and branches arching more than 120 feet, the immense oak tree is estimated to be between 200 to 300 years old. Efforts to preserve the burr oak began in the mid-1800s when Dr. and Mrs. E. H. Bradley purchased the land on which the tree stands. After Mrs. Bradley’s death in 1967, Peoria City Beautiful, the Peoria Park District and other interested citizens purchased the land from the Bradley family and ultimately created a park. Through a matching grant from the Housing and Urban Development “Parks in Cities” program, the Park District purchased the site in 1971. The park was officially dedicated on September 6, 1971. In 1974, the Park Board took action to adopt Giant Oak Park as the name of the location. The giant burr oak has been protected by a wrought iron fence installed many years ago. Additionally, the Park District purchased the Easton Flats property in 1992 to further buffer the tree. Lighting protection was also installed in 1996. As one of the largest urban trees under the ownership of the Park District, the giant burr oak qualifies for landmark status under criterion E of the District’s Register. Founded approximately 157 years ago in 1850, the Koerner Family Cemetery was one of the earliest family plots in Section 15 of Kickapoo Township. Koerner relatives visit the cemetery throughout the year. Civil War and Blackhawk War Veterans are buried in the Koerner Cemetery, each with a special headstone honoring their service. Jacob and Christina Koerner, five of their children and a number of grandchildren are also entombed in the cemetery. David W. Koerner and his wife, Louise, have a large monument on site. They constructed the large house in 1880 which still serves as a park office/private residence today. The Koerner Cemetery is used extensively for local historic interpretive programs. Public tours, including school groups, visit the site during Pioneer Days and other special events throughout the summer season. The general public has an opportunity to learn the history of the area through the lives of those buried in the cemetery. The Koerner Cemetery is suitable for landmarking under criterion B of the Park District’s Preservation Ordinance. Trustees of the John C. Proctor Endowment established the Proctor Recreation Center and Public Baths in accordance with the will of early Peoria philanthropist who left his estate to the community. During its early history, Proctor Recreation Center served the entire Peoria community as a recreation center and bathing facility. There were 53,000 showers taken at Proctor Center during its first year of operation. A serious decrease in the earnings of the Proctor Endowment in the lat 1920’s led the trustees to offer Proctor Center to the Peoria Park District as a gift. At that time, the Park District lacked the legal authority to accept the center and provide for its maintenance, the offer was rejected. Proctor Center was closed on December 31, 1932. The Park District eventually launched a successful campaign to obtain enabling legislation to levy an annual tax for the purpose of maintaining, improving and operating recreation and community centers. The levy was overwhelmingly approved and the Park District reopened Proctor Center in 1935. Proctor Recreation Center continues to be a landmark in the Park District and was listed in The National Register of Historic Places in 1979. In keeping with the purpose and intent of the District’s Preservation Ordinance, Proctor Recreation Center shall be listed in the Park District’s Register of Historic Places. Trewyn Park Pavilion was constructed as a multi-purpose public structure. The structure originally included a kitchen, banquet room, stage, main hall, dance floor and restrooms. During the early twentieth century, the dance floor provided users a more attractive alternative to beer gardens and other questionable resorts that were thriving in Peoria. Trewyn Park Pavilion was constructed for $22,205.00 and dedicated on November 23, 1913. Trewyn Park opened in the late 1890’s/early 1900’s and gained immediate popularity with the public. South Park, as it was originally known, was a convenient gathering spot for the predominately laboring neighborhoods of Peoria’s south side. With the construction of a children’s playground, the park site was ideally suited to school, church and other large picnics. Because of the extremely popular nature of Trewyn Park, and the constant demand placed on its resources, the construction of a year-round pavilion was needed to augment the original summer open-air pavilion. The Trewyn Pavilion served to complement perfectly the existing park facilities including a swimming lake and extensive playground equipment. Park Board Trustees adopted a specific ordinance for the newly opened Trewyn pavilion in November of 1913. The ordinance spelled out specifically who could use the pavilion and the manner in which it was to be used. For example, the picnic season was formally declared to be from June until the end of September. Cooking by churches and other fraternal organizations had to be done in the first floor kitchen, while no cooking was allowed on the second floor. The second floor could only be used for heating coffee. The Trewyn Pavilion has undergone significant alterations and modifications to the original design. In 1956, areas of the lower pavilion were enclosed to create a garage and more usable indoor space including restrooms. A second modification occurred in 1978 with the construction of a wheelchair ramp and other changes to the interior of the pavilion. During 2002, the building underwent a major structural renovation and restoration to repair deteriorating concrete decking, structural steel support beams, brickwork and ornamental pillars. Currently, the pavilion is used for public rentals on the upper level and a Head Start site with an adjoining apartment in the lower level. As a structure, the Trewyn Park Pavilion qualifies for Historic Designation and listing under criteria B and C.